In The Double Life of Fidel Castro, one of Castro’s soldiers of seventeen years breaks his silence and shares his memoirs of his years of service, his eventual imprisonment and torture for displeasing the notorious dictator, and his dramatic escape from Cuba. Responsible for protecting the Líder Máximo for two decades, Juan Reinaldo Sánchez was party to his secret life: from the ghost town in which guerrillas from several continents were trained; to Castro’s immense personal fortune, including a huge property portfolio, a secret paradise island, and seizure of public money; as well as his relationship with his family and his nine children from five different partners. Sánchez’s tell-all exposé reveals countless state secrets and the many sides of the Cuban monarch: genius war leader in Nicaragua and Angola, paranoid autocrat at home, master spy, Machiavellian diplomat, and accomplice to drug traffickers. 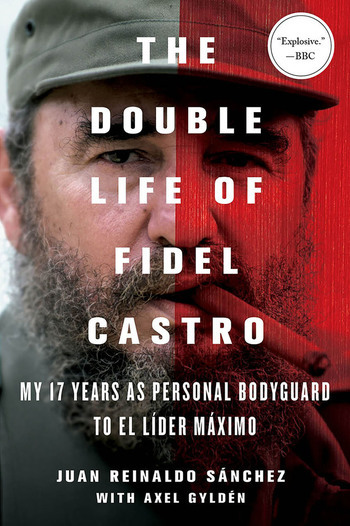 This extraordinary testimony makes us reexamine everything we thought we knew about the Cuban story and Fidel Castro Ruz. LIEUTENANT COLONEL JUAN REINALDO SÁNCHEZ was Fidel Castro’s personal bodyguard for seventeen years before being imprisoned in 1994 for the “crime” of wanting to retire early. He left Cuba in 2008 after ten unsuccessful bids to escape. He made a new life in Miami, where he passed away in May 2015.